• Versatile, fast day cruising sailboat/ club racer/ school trainer/ family favorite. • Comfortable carrying capacity for seven adults. • Manageable performance to satisfy even the most demanding sailors. Omega is just as happy sailed one up, two up or even seven up. The combination of the stability and performance together with reefing and easy control systems mean the Omega is the ultimate multi purpose family sailboat. The attention to detail given to the boat design and the deck layout means the Omega delivers versatility, comfort and performance without compromise. 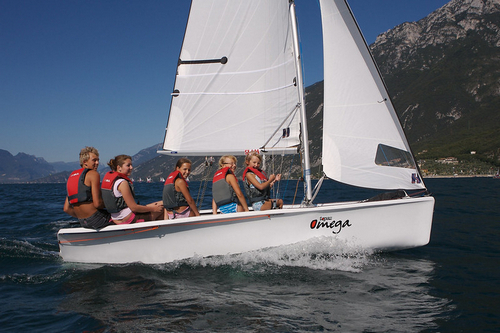 As you’d expect the Omega is ideal for family cruising and teaching newcomers. The added bonus is that she also offers more experienced sailors impressive performance potential, pedigree handling and high specification throughout. So you can club race or go for an uplifting blast in your Omega too. The Omega is the largest in the Topper range. The hull, at 4.7m long, 1.88m wide and with a depth of nearly 1m, has capacity for up to seven crew. The Omega is an incredibly versatile boat that is fantastic fast day cruising sailboat/ club racer/ school trainer/ family favorite. The beamy, chined hull inspires great confidence making the Omega more stable and easy to control. The huge, spacious cockpit with its gnav kicker offers roomy and comfortable sailing for a large crew. 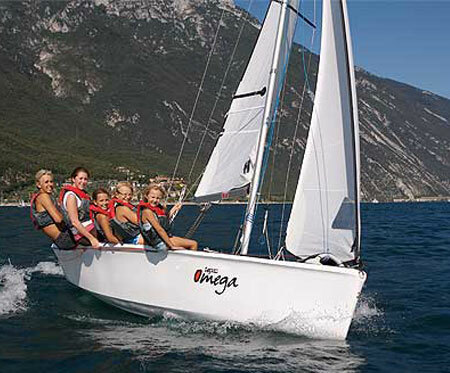 The Omega has a furling jib as standard and there is the option of a Dacron sail, more suitable for beginner sailors. The mainsail is equipped with a flotation device and this, together with the boat’s sealed mast offers safe, fun family sailing. Righting lines and grab rails are all fitted as standard. The boat can be sailed single-handedly or depowered using Selden’s simple single-line reefing system in the mainsail. The boat comes with epoxy center board and rudders fit for a high end racing class and all fixtures and fittings are of the highest quality available.